Pizza is one of the ultimate comfort foods but think beyond the classics like margarita and pepperoni and go off piste! Duck speck is a product that not a lot of people may be familiar with but is certainly worth acquainting yourself with it. It’s cured duck breast which is made using a concoction of herbs and spice and the fat content melts away in the cooking process. I pick mine up from Eat Drink Ideas on my local market and they can be found here. The smoky notes from the duck pairs perfectly with the delicate but sweet figs and the savoury onions. The base of the pizza is traditional but I used a cherry tomato passata which is sweeter than usual passata which worked much better here. You can make your own if you fancy! I also prepared a garlic and rosemary infused oil to drizzle over before cooking to add another dimension and pull the flavours together. Make more than you need and then keep it in the cupboard for next time. I use a pizza stone at home which I heat for around half an hour on the highest temperature that my oven can muster. Alternatively you can preheat a baking tray and use this instead but make sure you take care and dig out the oven gloves! 1. 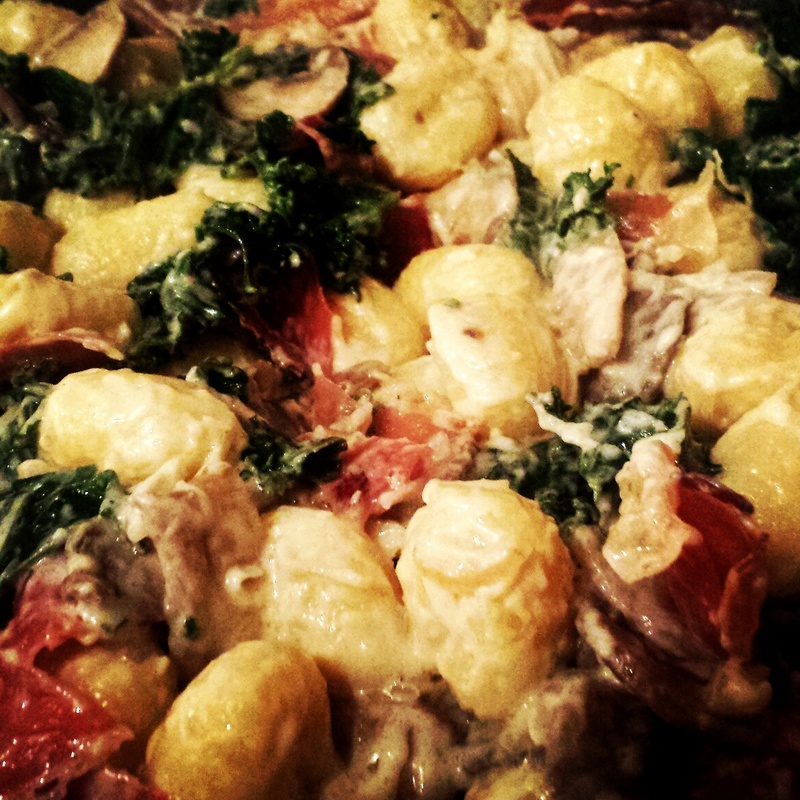 Start off by making the pizza dough in advance so it has plenty of time to prove. You can use a bread hook on a mixer or good old fashioned elbow grease for this. Add the flour into a bowl and add the yeast and salt into two separate sides of the bowl; ensure these do not touch when dry and the salt will retard the yeast’s action. Add the water and bring together to form a rough dough. If you are kneading the dough yourself then this will take around 10 minutes until the dough is ready or 5 minutes with a bread hook. When it is ready, roll into a ball, place on a tray and cover with a slightly damp cloth and leave to prove for 30 minutes. 2. In the meantime you can make the drizzling oil. Simply pour the olive oil into a small pan, add the rosemary and garlic; give the garlic a light bashing first to release the flavour! Heat the oil until small bubbles start to form on the bottom of the pan and remove from the heat. Allow to cool and set aside. 3. For the caramelised red onion, take a small pan and heat the oil and butter together over a medium heat. Add in the onion slices and cook for 10-15 minutes until translucent. Add the sugar and cook for a further 5 minutes until cooked down and sticky; remove from the heat and set aside. 4. When you are ready to cook the pizza, preheat your oven with either a pizza stone or tray to the hottest it can go. Roll out the dough as thin as you possibly can and place on the tray or stone. Using the back of a spoon, spread the passata on the base before sprinkling with the grated mozzarella and caramelised red onion slices. Distribute the sliced duck evenly followed by the fig segments. I placed these so the cut sides face upwards which looks great on the finished pizza. Drizzle with a little of the rosemary and garlic oil and pop in the oven for 10 minutes until golden, bubbling and irresistible! 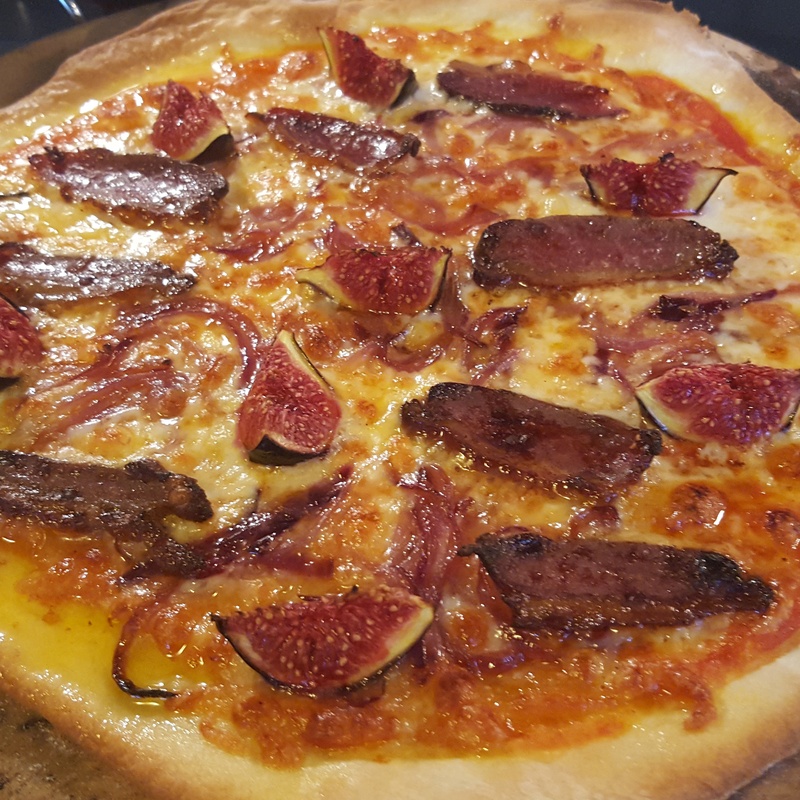 Duck speck, fig and caramelised red onion pizza- put down the takeaway menu and get kneading!